Socially-conscious, tech-savvy tweens can celebrate the true meaning of the holidays by donating the virtual coins they earn playing games online in Club Penguin, to real-world causes that matter to them. 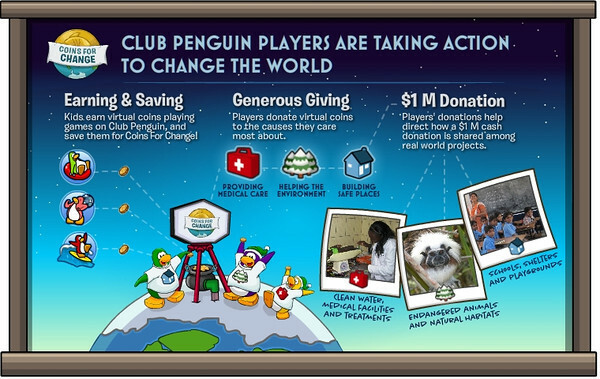 The annual Coins for Change program is in full swing through January 2, 2013 and lets players use their in-game virtual coins to determine where Club Penguin will contribute its sixth annual $1 million donation. This year, Club Penguin has transformed into the “biggest virtual bake sale ever,” with players baking millions of in-game cookies for the Club Penguin bake sale, and buying cookies using their virtual coins to cast their votes. Players can directly affect which charitable organizations will benefit from the donations. To reward players for virtually purchasing cookies in the game, they’re transformed into new holiday characters for a period of time. All players – even those playing for free – can transform into toy cars, while Club Penguin members can change into reindeer puffles and “frost bites” that allow then to temporarily freeze in-world items. Club Penguin has over 175 million players, and has donated $9 million to charities around the world through programs like Coins for Change.